Natale Zappia develops nz_Edge2Polygon, the newest sketchup extension that is available in extension warehouse. It generates polygons by maintaining perfect reference edge lengths. This extension is compatible with SketchUp 2016, SketchUp 2017, SketchUp 2018. The plugin is ideal for enhancing your drawing and productivity. nz_PolyhedralJuctions also comprises of nz_Edge2Length and also provides more complicated operations. Here n denotes nth number or sides. A truss is presented as a framework for designing and construction field like a structure of elements which act as a single component though in combined situation and provide the support for the bigger structures. Naturally the design of an architectural truss is dependent on various calculations counting the effects of physical forces like weight, compression, material limitation etc. and the calculations are till now alarming and time consuming. 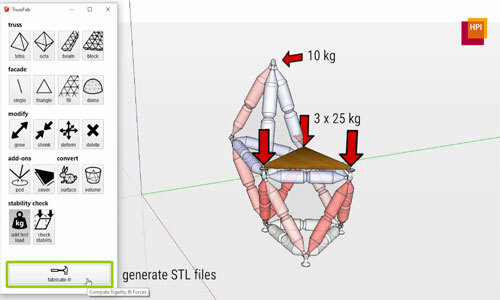 Robert Kovacs and his research team at Hasso Plattner Institute has been inventing to find a process of automating those calculations and there search and efforts have ended after creating TrussFab; it is a SketchUp Extension that make the 3D printable truss elements popular for the SketchUp users. This TrussFab helps users for rotating SketchUp geometry into a truss network which can smoothly be put together in real life with the recycled materials. This truss network with the recycled materials provides the users the ability for gathering trusses to their own projects easily, faster and reliably. About the project: It is a unique project and thinking that has started two years ago at Hasso Plattner Institute and has attracted many undergrad and grad students to work here, the main team consist the following members: Robert Kovacs, Anna Seufert, Ludwig Wall, Hsiang-Ting Chen, Florian Meniel, Willi Muller, Sijing You, Maximilian Brehm, Jonathan Striebel, Yannis Kommana, Alexander Popiak, Thomas Blasius and Patrick Baudish. Robert and the Truss Fab Team have highlighted some points on their works and they have started working on the plastic bottles and have created so far some amazing projects. Idea of TrussFab: Robert‘s first project was the Protopiper at the Hasso Platter that focused on prototyping room-sized objects at perfect scale. After that the team has planned to take forward the idea of large-scale personal fiction for more functional objects and the result was complementing small 3D printed parts with ready-made objects that became plastic bottles. They also realized the need of the key design principle is always fro closed triangular contours, trusses or otherwise the connectors or the bottle will break. The underlying physics of the forces: Truss structures are containing of triangles arrangements; that’s why the structures block deformation than only the individual object. The main strength of trusses is that they turn side forces or bending forces into tension and compression forces with the length of the edges or members. 3D printed hubs in the extension: Robert and the Truss Hub team has rated many hub designs proficient to hold the bottles or any objects together and they also used a threaded-snap connector pair for each edge. After that they settled on a design which can adjust various kind of objects (here bottles) and easily apply the 3D print; initially this design has the connector with only a simple projection. Incorporating engineering functions into the application: TrussFab and Robert have the main goal to give a chance to the beginner users for building structurally firm large-scale things in just some minutes. The fundamental design principle behind TrussFab is well known in architecture that is less understandable in everyday life and the 3D printers can manufacture more objects with a better quality. The observation of materials and the wall thickness of the designs often fail as the forces grow numerically with the size of the object; it can overcome by implementing truss-specific functions to help users to create sturdy structures. In addition the editor of TussFab offers primary shape fundamentals as the elementary formed trusses, tools that can create large beams in the form of trusses and tools to tweak the shape of structure in the time of maintaining inflexibility. The most inspiring structure: The largest structure according to Robert and his team was a 5m high pavilion for the CHI’17 conference that was made more than 1500 bottles and 191 3D printed hubs and was designed by the architect Oanh Lisa Nguyen-Xuan with the help of TrussFab’s editor. The process of extension self-validate larger structures: At first the effect of weight of any structure placed upon the Structure is computed by TrussFab and they use the software here. The software generally finds the flaws in the truss structure and searches the parts which are not locked properly in place by other members can be subjected to shear or bend forces. In case, if such kind of forces can be found then the software would place additional balancing member; then the software examines the capability of the structure. The software analyzes the applied forces through finite element analysis for every member of the structure and shades every member accordingly. 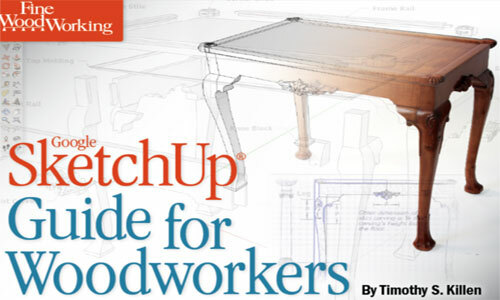 Digital tools used in TrussFab: SketchUp is the most used tool and far most the best software for designing and planning the models in TrussFab. According to Robert, SketchUp is a vast and available platform for 3D projects that help them to make their project easily in 3D editor. Besides SktechUp, they use some additional tools also like Karamba 3D to estimate the forces inside the structures and OpenSCAD for creating the precise hub geometries for 3D printing. Use of bottles in structures: TrussFab uses the normal soda pop bottles as a recycled product to make structures of their models which they buy from the local stores of Germany. They used refillable bottles for higher structural stability that provides them strength and make strongest and on the other hand the softer bottles are inflated to get the same strength. Being a leading name of software development for animation, creation, rendering and Integration, E-on software always keeps a game changer attitude with the new application for the users. The new releases continue to cast a spell over the 3D designing world with advanced functions and tools. Their effort makes the virtual world as much real as the real one with all equally viable substances. The new Release 3 of VUE and PlantFactory 2016 retain the legacy. These applications are smart enough to add nuanced details to your design, adding a real feel to the virtual world. The free version of the software application is available for the users. These applications come up with as many features as you may want to have to create a magical 3D work the same as you expected. The new versions always bring forth the company’s objective towards creating an amiable space for designers and artists. It always goes a step further to reflect a sense of innovation and creativity of the designing. The main objectives remain unchanged in their designing and the releases – offering a user-friendly approach, enhancing the base of the current technologies, improving the performance of the application gradually. The features are concentrated completely on enhancing the users’ experience in designing. The details make your work livelier and better than ever. E-on software application does its best job in presenting tools and application that add real sense to designing. Enhancing the core offering of the previous releases of these two applications, the company has been successful to live up to its expectation like before. Personal learning edition and the trial version is available for the users. You can download from the company’s official website. In this sketchup video, Aaron provides brief demonstration on some mini sketchup extensions which can be operated with some simple clicks of the mouse. These extensions are Weld, adebeo_Pushline and Solar North. Weld: Smustard Team has developed this sketchup extension. It supports SketchUp 6, SketchUp 7, SketchUp 8, SketchUp 2013, SketchUp 2014, SketchUp 2015. The extension is used to choose numerous connected edges, curves, and/or arcs (“connected” signifies having common endpoints) and combine them into a single “polyline” with the use of weld tool. adebeo_pushline: Denis B has developed this sketchup extension. It is compatible with only SketchUp 2016. This extension can be used to push edge. Just choose the tool and click on an edge or preselect and click on an edge and push it. The plugin is available in different languages like Brazilian Portuguese, Chinese, Chinese Simplified, Czech, Dutch, English, French, German, Italian, Japanese, Korean, Polish, Russian, Spanish, Turkish. Solar North: The sketchup team has developed solar north. This sketchup extension is compatible with SketchUp 8, SketchUp 2013, SketchUp 2014, SketchUp 2015, SketchUp 2016, SketchUp 2017. It offers a wide array of tools to arrange and demonstrate the solar north angle that SketchUp employs to calculate the sun location as well as shadow directions. It is mostly suitable when a model is imported with a dissimilar “north” than SketchUp’s default. To run this extension, an active SketchUp Pro license is essential. In this sketchup video, you will learn how to create 7.5×9 m size home plan with four bed rooms in sketchup. SAM-ARCHITECT has modeled this 3 storied villa with sketchup. Sketchup is good for designing home plan as it can generate either schematic or full construction documents easily. 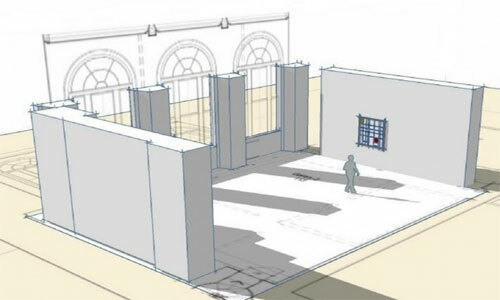 Sketchup can be used to measure the area of any room. In Sketchup there are various useful tools like pencil tool, push and pull tool, section plane tool etc. to generate customized objects with a high level of detail. The plan of a house can be produced in a 3D view or a 2D view.